Acupuncture has been used as a primary health care system of China that can be traced back at least 6,000 years. It involves the insertion of very thin, disposable and sterilized needles into specific acupuncture points that run along a meridian to stimulate and balance the qi (energy flow). This harmony allows the body to repair itself and maintain health. Depending on the patient and the condition being treated, the number of needles inserted varies. It is a safe, painless, and effective way to treat a wide range of medical problems. 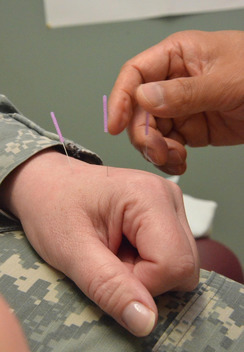 Overall, acupuncture is used traditionally to prevent, diagnose and treat the disease. Qi means life energy, energy flow or life spirit, a vital force that flows through all living things. In TCM, Qi flows smoothly throughout the meridians, but when Qi is blocked or unbalanced there is pain and illness. The blockage in the movement of qi is like a dam that backs up in one area of the body and causes the flow of energy to become restricted in other areas. The acupuncture needles unblock the obstructions at the dam and reestablish the regular flow through the meridians. Poor nutrition, physical and emotional trauma, stress, seasonal changes, environment, injuries, malfunction of a organ or overexertion are among the many things that may affect the flow of Qi through the meridians. The main function of acupuncture is to regulate the circulation of qi (vital energy) and blood. By inserting and stimulating the body's various systems, acupuncture can help improve sleep, digestive function, help resolve pain, reduce inflammation, reduce stress and restores balance in the body. Acupuncture is known to treat a wide range of disorders including neurological, cardiovascular, respiratory, endocrine, gastrointestinal, sporting injuries and psychological conditions. Neurological conditions such as headaches, migraines, difficulty sleeping, nervous tension, stroke,facial neuralgia, trigeminal neuralgia, some forms of paralysis, , peripheral neuropathy, noises in the ears, dizziness, and Meniere's disease. Digestive system disorders such as toothache, hiccups, gastritis, heartburn, flatulence, IBS (Irritable Bowel Syndrome), diarrhea, constipation and weight control. Urogenital disorders such as cystitis, prostatitis, low sexual vitality, urinary retention, kidney disorders and nocturnal enuresis. Gynecological and obstetric disorders such as premenstrual tension, painful, heavy or irregular, or the absence of periods, abnormal uterine bleeding or discharge, hormonal disturbances, disorders associated with menopause, prolapse of the uterus or bladder, difficulty with conception and morning sickness. Skin conditions such as eczema, dermatitis, psoriasis, nerve rash, herpes zoster, acne, scar tissue and hair loss and dandruff. Eye conditions such as visual disorders, red, sore, itchy or watery eyes, conjunctivitis and simple cataracts. Musculoskeletal disorders such as osteoarthritis, sciatica, lumbago, weak back, low back pain, rheumatoid arthritis, gout, shoulder and neck pain, 'frozen shoulder', and 'tennis elbow'. Sporting injuries such as sprained ankles and knees, torn ligaments and bruises. Acupuncture: Acupuncture is a healing technique of Traditional Chinese Medicine that dates back about 6,000 years ago. Acupuncture treatment uses very fine, sterile, single-use disposable needles inserted into the skin at specific sites know as acupuncture points. Electro-acupuncture: Is applied to inserted needles to stimulate the acupuncture points. Chinese Herbs: Herbs help to treat the acute and chronic conditions such as killing the bacteria or a virus. It helps to maintain daily life by keeping the balance of the human body. Chinese Herbs can help with a wide range of issues such as pain, insomnia, digestive, respiratory, allergies, immune system, etc. by strengthening the body and helping it to recover. Tuina: A therapeutic form of massage applied to or around muscles and tendons. This method is used to treat muscle and joint pain, stiffness, sciatica, arthritis and muscle spasms. Mei Zen Cosmetic Acupuncture (Facial Rejuvenation): Fine needles are inserted into the dermis layer to stimulate collagen growth. Gua Sha: A light scraping on the skin in a small area using a smooth-edged instrument. The scraping motion may create raised redness or bruising. Any bruising usually resolves in 3-7 days. This method treats colds, fever, flu, strains and muscle pain. Moxibustion: A form of heat therapy in which a mugwort herb (Ai Ye) is burned near the surface of the skin. Moxibustion can be used to treat a variety of diseases such as skin conditions, chronic weaknesses, gynecological disorders and digestive disorders. Essential Oils: Different oils can help with healing effects mentally, physically, and emotionally. You can apply them directly onto your skin, inhaling, or use it through a diffuser. Mei Zen system is good medicine because not only do patients get good cosmetic results, they also get good health results. Acupuncture needles are inserted into the dermis layer of skin to stimulate collagen and elastin growth. Your complexion reflects the result of the state of Qi in your entire body. The treatment is balancing your overall Qi thereby improving your general health with this protocol is simply the best anti-aging medicine around. Our Mei Zen Cosmetic Acupuncture Package costs $680 and includes two treatments per week over the course of five weeks. It is very important to follow this protocol for optimal results, because it takes four weeks for the collagen in the face to re-set.